So that's what I've done ! Could anybody try to explain WTF is going on ??? It's elementary: He must have found out that I am in the market for one more of those since I have only two of those yet and that I am a firm believer in overspending. 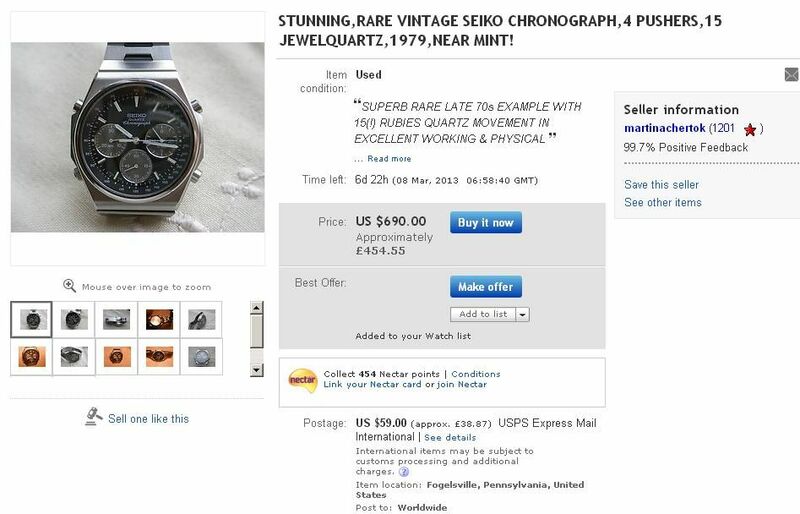 What's really weird about this eBay seller, is that he (or she ?) 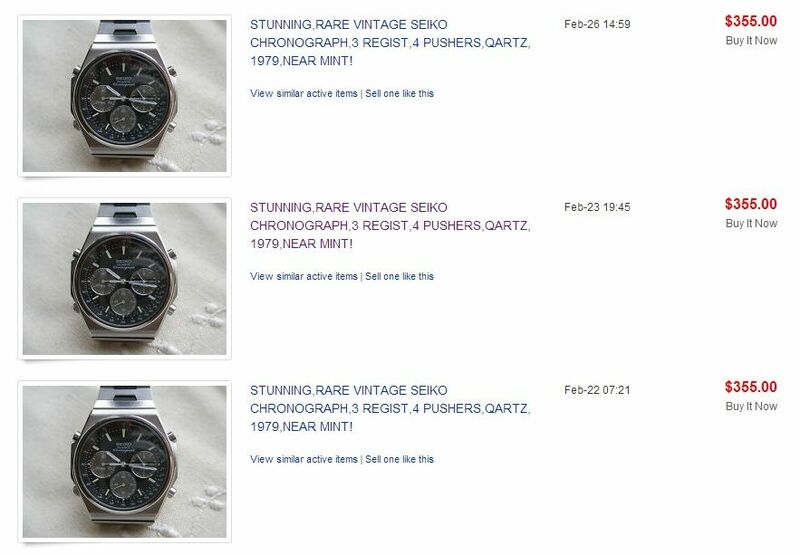 isn't actually 're-listing' these auctions for this 7A38-7000 as such. This manic would-be seller appears to be ending the current listing early by (sometimes) deleting it and then re-entering it, manually. Presumbably they're using some kind of template, because they keep repeating various errors, like QARTZ, 1979 in the title. At this point, I'm not sure if this is one particularly dumb eBay seller, or possibly one who is trying to be clever. I'm going to see if I can produce an audit trail on this one - that's if I can actually keep pace with the multiple re-listings !! On this first listing, he deleted half the photos, replacing most of them with better shots (which conveniently hid the iffy bracelet link). 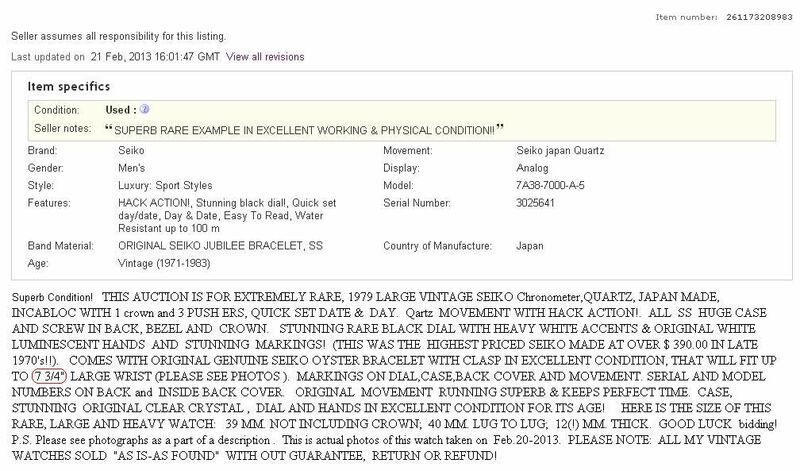 He also made some changes to the description, including increasing the bracelet's 'LARGE' wrist size from 7¼" to 7¾". Seems I spoke too soon. Truly unbelieveable !!! Do I hear $500 anybody ? Actually, my dear Harry, it is elementary (if you do a little detective work). 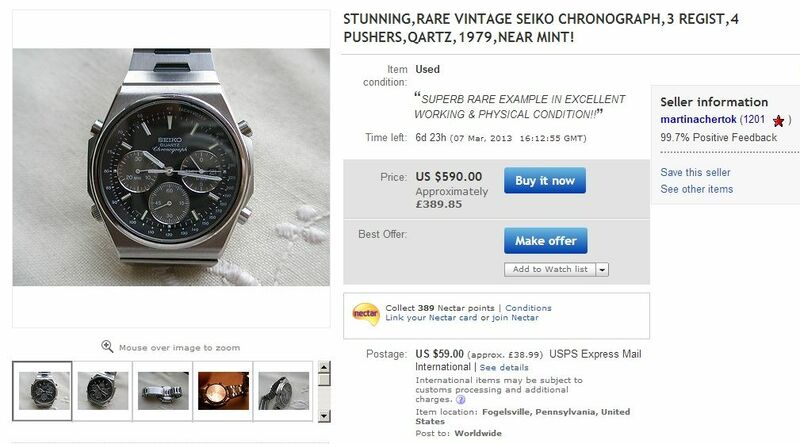 Like yourself, I'd naturally assumed the seller was a 'He' at first. 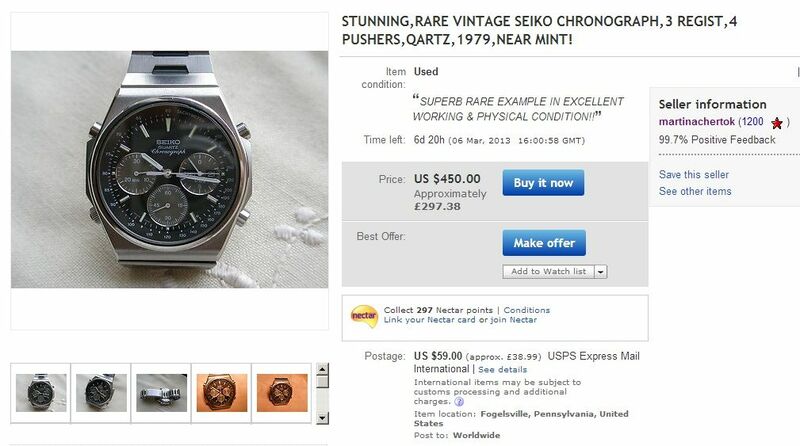 But look again at the eBay seller ID 'martinachertok'. That's not Martin A. Chertok .... it's Martina Chertok (female) who lives in Fogelsville PA (as given in the item location). As you know, it's a woman's prerogative to change her mind - that's if she's actually got any idea in the first place (obviously not). Or perhaps it's just 'the wrong week'. Me ? 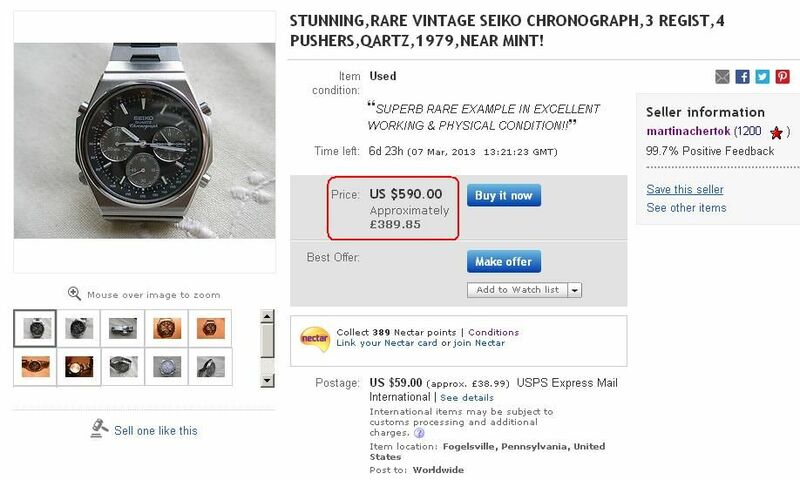 Unfortunately I only have the one stainless 7A38-7000 in my collection - and unlike this seller's offering, my example truly is Stunning. Mint etc. It's virtually unworn. I bought it on eBay in March 2009 - the first one I'd clapped eyes upon, funnily enough. You really wouldn't want to know what I paid for it back then. 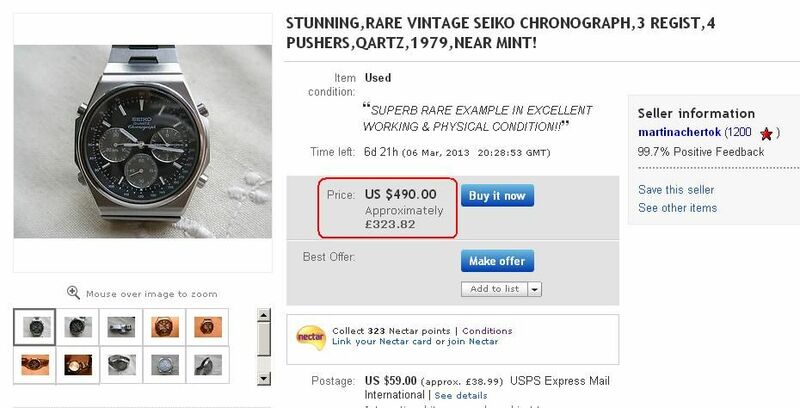 But it must be worth at least $750 now compared to her price. Funnily enough, I nearly started a topic along these very same lines a couple of weeks ago. 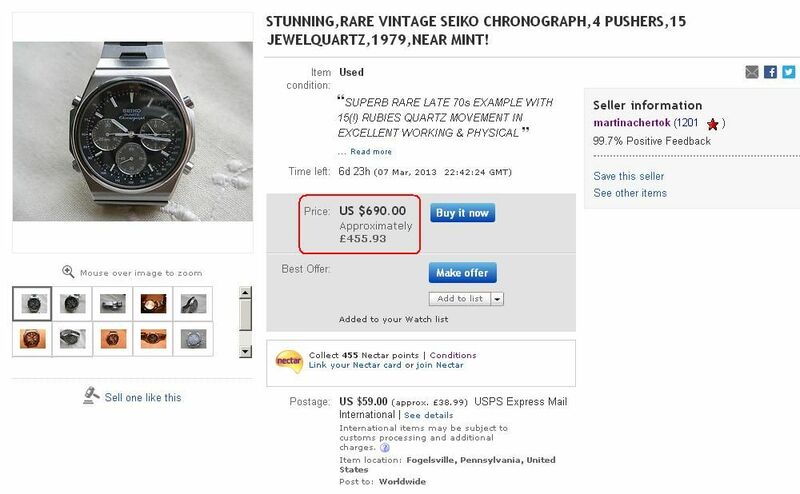 Another 'apparently confused' US eBay seller re-listed a stainless 7A38-7270, using the same ended early and re-enter technique. Though with this 7A38, I suspect it was more a case of total incompetence by the seller, rather than attempted 'jiggery-pokery'. Getting back to the original subject of this thread .... Truly unbelievable !!! The 9th listing and another price hike of $100 !! God only knows why, because it's back (yet again, listed for the 10th time in 7 days) at the same ludicrous $590 ! Correct, it seems - James !! GO AHEAD---- MAKE ME AN OFFER -----ONE NEVER KNOW WHAT I MAY ACCEPT! You'd have to move bl**dy quick to get an offer in before she cancelled the listing yet again. That 11th listing lasted even shorter. At the time of writing (17:10 UK GMT) it hasn't yet re-appeared. Nope - it's back again for the 12th time !!! 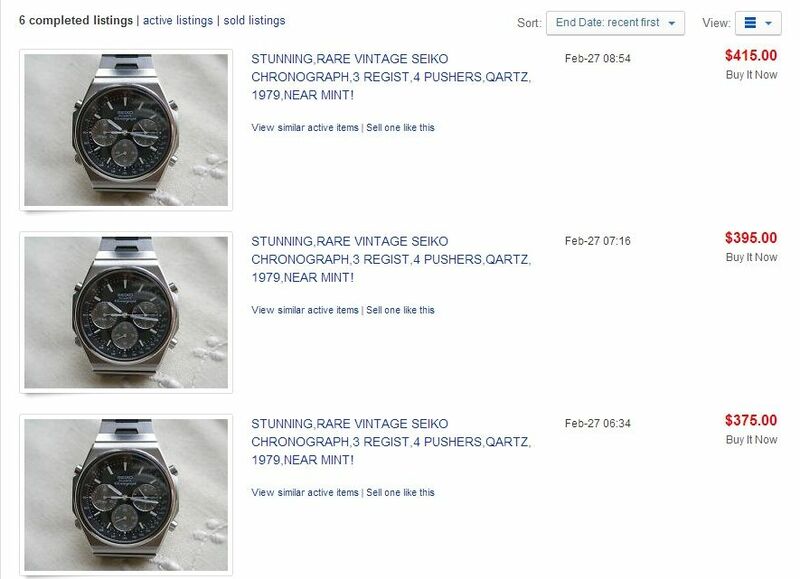 http://www.ebay.co.uk/itm/261177449128 For how long this time, I wonder ? Strike that - the 12th listing (and 4th at $590) was ended appoximately 15 minutes later at 17:25:55 GMT UK time. PS - unless the price changes, I'm not going to bother posting screen prints any more. I think everyone has already got the picture. 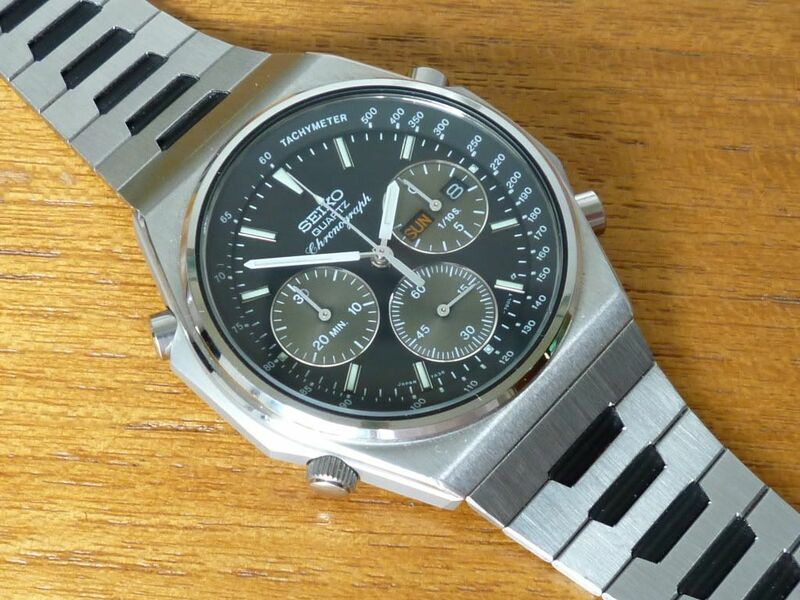 Note the last one was a 'KEIKO' (rather than SEIKO). I guess She is trying to sell to prospective ebayer's who search newly listed items. This can be the only feasible reason for re-listing over and over in short durations. Looks crazy though when you use Paul's link above! Heh... Just dropped by for an update, nothing doing. Back to Ebay... IT'S BACK! Well spotted James. I'd given up refreshing my search hours ago. Listing # 13 - unlucky for someone. 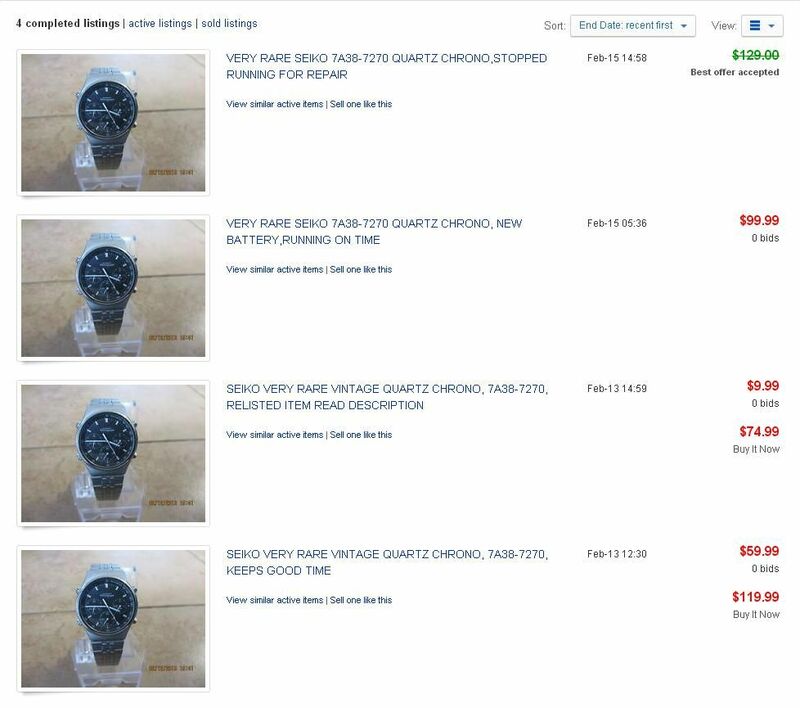 Probably this crazy would-be seller. and that '3 REGIST' has been replaced by '15 JEWEL'. So the seller appears to be learning gradually - if not about selling prices. I think I can safely predict yet another (15th) revision within the next few hours. Viz: .... 1979,NEAR MINT! 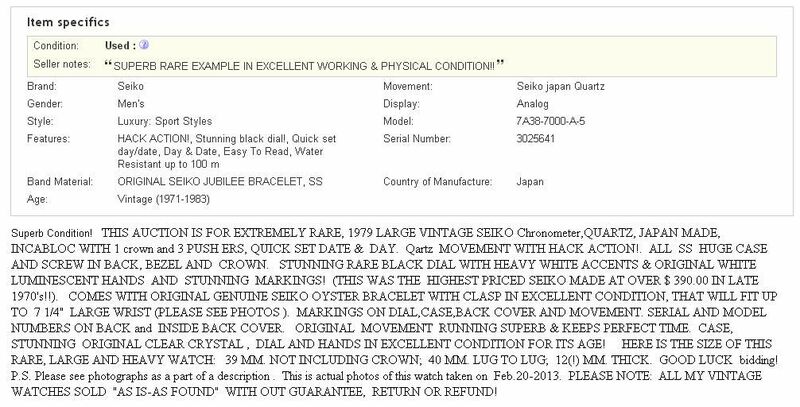 and Item condition:Used “SUPERB RARE LATE 70s EXAMPLE ...."
The case-back serial number in seller's listing photo clearly shows that it was actually manufactured in October 1983. Ho Hum. 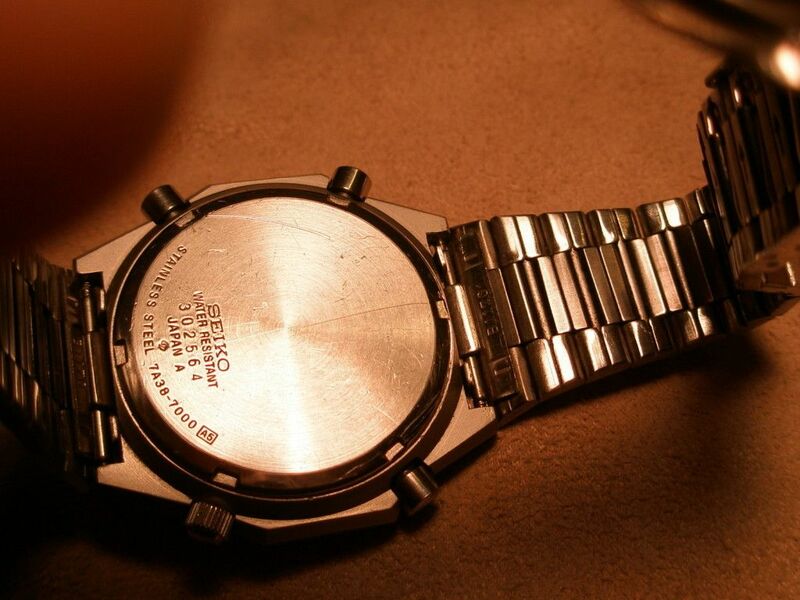 someone needs to give this poor watch a good home!